Specialization: In the company as of the first day. Motivate young people to continue studying and train a quarry of future workers! 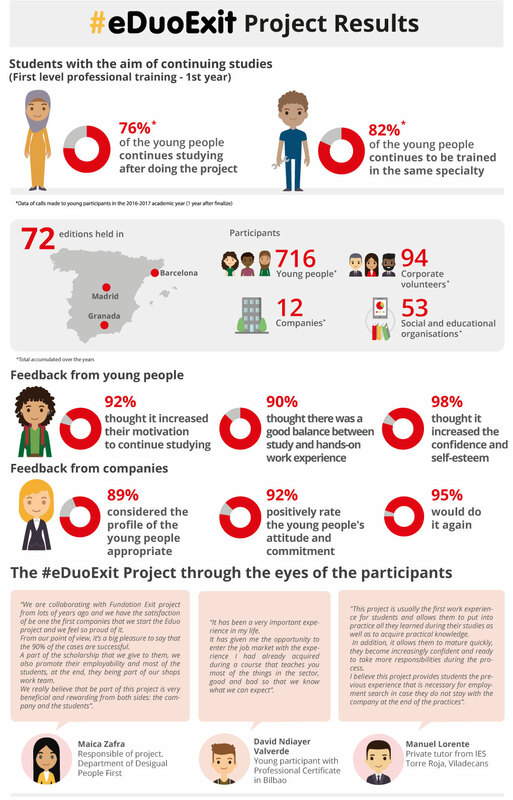 The eDuo Project is committed to supporting young people from the beginning and especially the whole class. Through innovative methodologies and ideally the co-creation among young people, professors and companies, at the beginning of the first course motivating educational challenges are raised, linked to each training specialty. Throughout the year, participants receive masterclasses, sessions given by company volunteers, with innovative content and impact, which allows young people to discover the sector, the company and the profession. In addition, through the group mentoring, the young people, organized by groups, have company mentors and Exit Foundation technicians who, together with the tutors of the educational center, will accompany them throughout the process. At the end of the course, the educational challenges worked and the results obtained are presented. For the company: it is a magnificent opportunity to meet and attract talent, form a quarry of future workers for the sector and promote the competence development of its current employees. To the educational center: will allow you to align your training with the reality of the labor market, complete the curriculum of the classroom with the expertise of the company, as well as minimize early school leaving. For young people: they will improve their motivation with the figure of mentor and peer group, increase their employability by receiving direct training from the company and expand their orientation by knowledge of the labor market. project and we feel so proud of it. well as to acquire practical knowledge. the 90% of the cases are successful. company at the end of the practices”. If you are a participant of the eDuo Project, access the management platform.